Join me in my time machine as we spin back to the mid 1970s. I was ____ years old and having outgrown most of the current Marvel and DC Comics I had turned my attention to the Black and White Magazine-sized Comicbooks then available. I already had quantities of Mad Magazine, Cracked, Sick, Rowan and Martin’s Laugh-In, Famous Monsters of Filmland and others of that ilk. DC never really pursued this format despite an odd book or two like “In the Days of the Mob”. Marvel tried to push Warren out of the market by swamping the news-stands with their own horror books such as Dracula, Savage Tales, Conan and assorted Zombies. 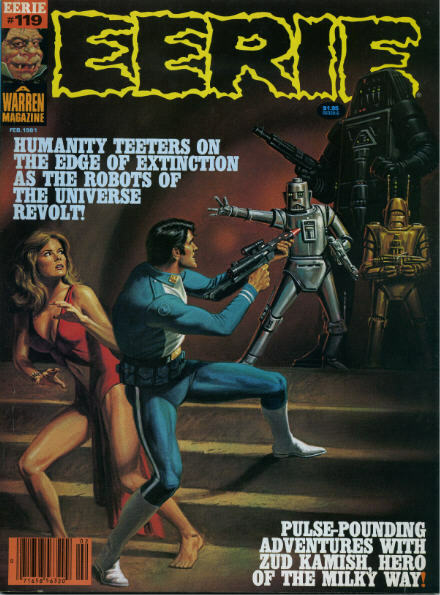 My favourite Marvel Magazines then were the anthology titles such as Marvel Preview/Bizarre Adventures and Unknown Worlds of Science Fiction. (And later I enjoyed The Hulk and Howard the Duck in glorious black and white adventures.) But I still preferred the Warren magazines. Alas Warren tended to reprint stories regularly. 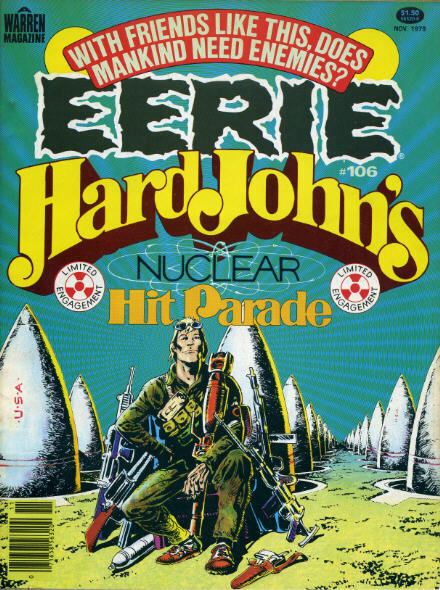 Eerie 106 collected Hard John’s Nuclear Hit Parade. This was another odd story written by Jim Stenstrum. 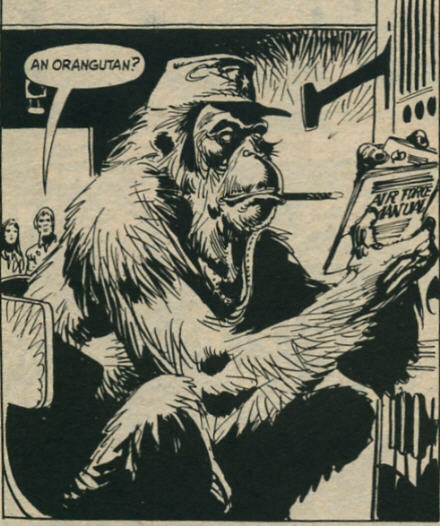 The nuclear destruct buttons needed two people to press them simultaneously… or an orangutan!! 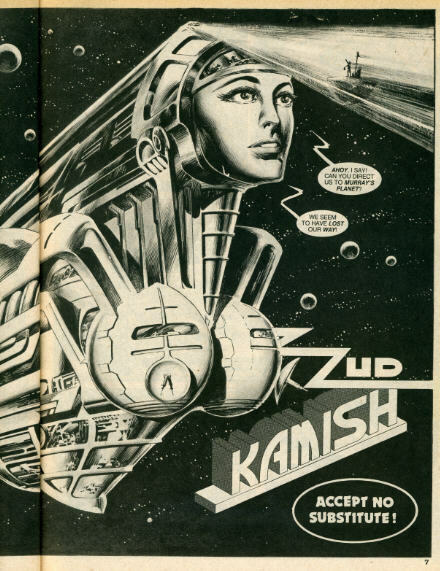 Eerie 119 featured Zud Kamish. How can you not want to read a story with a splash page like this? 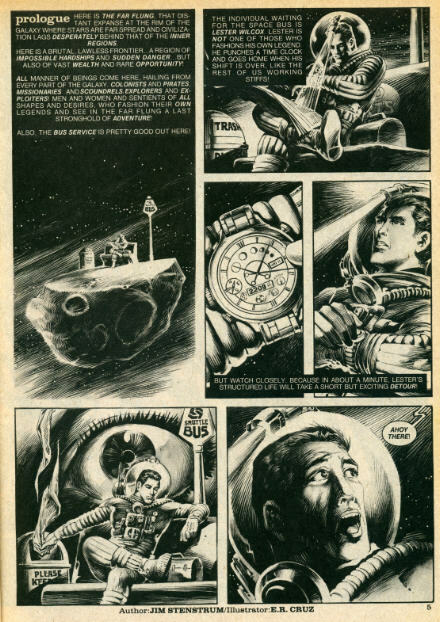 Or the next two pages featuring the oddest spaceship ever! In the future the same problems still seem to occur. Warren Comicbooks were just that little bit too far ahead of their time. Most of their sales were via regular newsagents/news-stands. Their distribution here was patchy at best. Comic Shops were not yet commonplace. Almost as soon as Warren folded in the 1980s direct distribution became the norm, Comic Shops appeared in every town (or at least in every City in the case of the UK), hundreds of new Comic Publishers unleashed hundreds of (mostly) rubbish comics onto a new generation of collectors/speculators.If Warren had hung on a few more years they would have found an enormous market for their product. Who were these people buying Radioactive Adolescent Teenage Ninja Biker Turtle Mice from Mars? Why hadn’t they bought Vampirella and Eerie? I suddenly felt very old but continued to observe the madness of the 1980s from the sidelines with a knowing smile. Comments Off on Warren Comics – Ahead of their time?